Since tower defense games are very popular, there's a constant stream of new titles that keeps most fans of the genre happy. It's been over a year since we last presented you a list of free tower defense games for Android, so it's time for a new one. However, the games that you'll discover below are not necessarily released this year. Some can be a bit older, but we didn't manage to include them in any of our previous lists, so, here they are (in alphabetical order, with download links included). Do you know any new tower defense games that are worth playing on Android? Let us know in the comments! Army of Darkness Defense is not your regular tower defense game, sharing elements with mega-hit Plants vs. Zombies (which, of course, isn't your regular tower defense game, either, but it's still included in this genre). Based on the 1992 horror comedy film of the same name, Army of Darkness asks you to play as Ash, an S-Mart sales clerk who somehow traveled back in time to the 13th century and now has to defend a castle from waves of evil undead. You can summon allies, use special abilities, and laugh at tens of funny quotes from the original film. Download (free, with in-app purchases). The original Bloons TD is a highly appreciated tower defense game, but it's not free. However, Bloons TD Battles doesn't cost anything to play - although, of course, it offers in-app purchases. Bloons TD Battles lets you play head-to-head with other gamers, offering 18 custom head-to-head tracks, 20 "monkey towers" (each of them upgradable up to 8 times), various achievements to claim, and lots of fun. The game has three modes: Assault, Defensive, and Battle, so you're not going to be bored too quickly. Since we didn't include Kingdom Rush in our previous tower defense games selections, we'll do it now. Seen by many as one of the best tower defense games available on smartphones, Kingdom Rush looks neat, has a great game play, and features with numerous tower upgrades with different abilities (to better help your strategies). There are over 50 distinct enemies to fight off, including hard to annihilate bosses. In addition to towers, you can use heroes to try and defeat invaders. Two paid versions of this game also exist: Kingdom Rush Origins, and Kingdom Rush Frontiers. Succeeding Myth Defense: LF (Light Forces), Myth Defense 2: DF (Dark Forces) changes everything by asking you to fight for the dark side, and defend your stronghold from the light forces. You'll be able to make use of Necromancer, Golbin, and Orc technologies to masterfully build towers and traps. The game is free to play, but you can pay to upgrade to a "Platinum" version. Fans of both steampunk and tower defense games should enjoy playing Steampunk Defense a lot. The game features modern elements like snipers and rockets, but also things like ice towers. You'll battle in various environments, including jungles and deserts, while being able to upgrade your troops in a laboratory. If you like the free version of Steampunk Defense, you can pay to buy a Premium version. 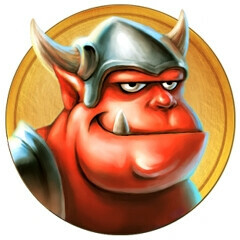 The highly rated Towers and Trolls is seriously a very well executed tower defense game, with cool graphics and fast-pace action. You get 4 game modes to choose from (Campaign, Challenge, Open Mode, Endless Journey), 10 different worlds to fight against trolls in, and "outrageous" special weapons like poison gas clouds. Set in a medieval fantasy land, this game will keep you hooked for hours, trying to defend your kingdom against toy-like enemies (including mercenaries, trolls, and dragons). Of course, you have toy-like units of your own, and you can compete in tournaments with your friends. Toy Defense 3: Fantasy also has a paid version. What, another Toy Defense? Well, yes, but this one's set in the future, when you'll have to defend the universe against hostile aliens and droids. Over 70 missions, various maps (set on Mars, in outer space, or on alien jungles), and an extensive power-ups system (to upgrade units) are waiting for you. Like Toy Defense 3: Fantasy, this game has a paid version, too. Kingdom Rush is brilliant. I am surprised it's free now but everyone should play it. It's honestly one of the best games I have played mobile, play station, Xbox , or PC. It's straight out brilliant. Kingdom Rush is the bomb. Defense zone 2 HD is my favorite. I like the modern tanks, missiles and aircrafts used in the game. Here are a few more of my favorite tower defense games for Android & iOShttp://www.techpik.com/best-tower-defense-games-android-ios/. Radiant defense is a great choice in the free category.